* "Daddy, Brother, Lover, Little Boy"
Video footage of the press conference and performance can be viewed below. MR. BIG'a June 20 concert at Budokan in Tokyo will be filmed and recorded for an upcoming DVD and CD. Billy Sheehan told MusicRadar about MR. BIG's decision to reunite for a tour of Japan, "We got together last fall. It was just one of those things, the timing was right. We played a gig at the House Of Blues in L.A. and we smoked the joint. Afterwards, we all kind of looked at one another and were like, 'OK, that was cool...Now what?'" "We're in this to play and have a good time. When you consider the amount of rehearsals you have to have with a band, how much time you have to spend together, how many hours you have to sit on planes and backstage and whatever, there's no amount of money that can make it worthwhile unless you really want to do it." 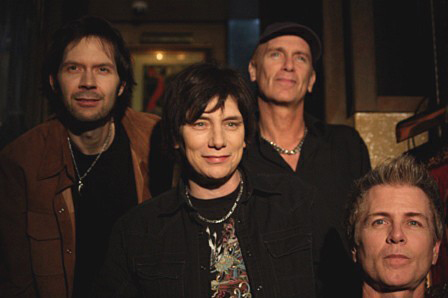 Formed in 1988, MR. BIG is probably best known for its 1991 rock hit "Green-Tinted Sixties Mind" as well as the 1992 acoustic smash "To Be With You". Paul Gilbert left the band in 1997 to pursue a solo career and eventually reform RACER X. Richie Kotzen, another Shrapnel artist and former guitarist for POISON, was brought in to take on guitar duties, also contributing occasional vocals. Two studio albums were released by this lineup — "Get Over It" in 2000 and "Actual Size" in 2001, which featured the single "Shine", used as the ending theme in the animation series of "Hellsing".